The spacecraft of the BepiColombo mission to Mercury have arrived safely at Europe's Spaceport in Kourou, French Guiana, marking the start of six months of preparation to ready the craft for launch. 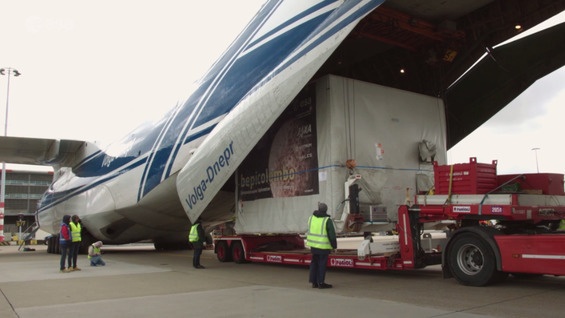 The joint ESA-JAXA mission, which comprises three spacecraft modules and a sunshield, were transported from their home base in ESA's technical heart in the Netherlands by road to Amsterdam Schiphol airport. They were flown to Kourou, French Guiana, on a series of four Antonov cargo aircraft over the last two weeks. MPO unpacked at Europe's Spaceport. MMO unpacked at Europe's Spaceport. The ESA Mercury Planetary Orbiter and the JAXA Mercury Magnetospheric Orbiter will travel together to the innermost planet, carried by ESA's Mercury Transfer Module.